Our Mission: to be the most trusted partner in aerospace surface finishing. Valence Surface Technologies is a full-service surface finishing company specializing in the commercial aerospace, defense, space and satellite industries. With 10 strategically located sites across the United States, Valence provides a start to finish solution from NDT and chemical processing, to paint and sub-assembly. Traditionally, the aerospace supply chain has been a fragmented system comprised of many different suppliers completing a different step of the chain. One company may be responsible for the initial inspection and shot peening, and then another anodizes, while another has responsibility for the paint, and so on and so forth. These processes may take place spread across the country, at great cost due to unnecessary lead time, inventory, risk, and management resources. Valence exists to change the supply chain. By providing an all-inclusive solution in every region of the country, we reduce cost, the amount of suppliers, the distance parts must travel, lead times, while maintaining the capacity to grow with new programs. We do this by maintaining over 2,500 approvals, for every prime and program in existence today. Valence is the world’s largest independent aerospace surface finishing company. We are unique in that we are the only complete integrated solution in the supply chain, saving time and money for our customers. With our nationwide locations, we have the capacity to grow with you as your business does. Many may know our various locations by their legacy names, including: Coast Plating in Los Angeles, CA, Coastline Metal Finishing in Garden Grove, CA, Tri-Process in Paramount, CA, MAPSCO in Seattle, WA, Bluestreak Metal Finishers in Everett, WA, Pride Plating in Grove, OK, Dynamic Paint Solutions in Eastman, GA, and Chrome Plus International in Wichita, KS. With a combined 300+ years of experience, you can count on Valence for the guidance and expertise to have your parts finished right. As the world’s largest independent aerospace product finishing company is the ONLY company that offers a completely integrated solution serving the aviation, defense and space industries. UNMATCHED breadth of capabilities with core services that include Non-Destructive Testing (NDT), Shot Peening, Chemical Processing, Plating, and Spray Coatings. With over 3,500 unique approvals, we offer the MOST COMPREHENSIVE special processing capabilities for high-value, mission-critical parts, no other company matches our capacity and global reach. With eleven facilities comprising over 750,000 sq ft of manufacturing space located in key global aerospace manufacturing hubs, we service over 3,000 global customers supporting EVERY MAJOR commercial, military, missile, UAV, space and satellite program in North America, Europe and Asia. SIGNIFICANT CAPITAL investments in capacity and technology that improve productivity, reduce supply chain costs, enhance lead time, mitigate risk and lead to greater customer value, all while providing lead edge environmental stewardship and compliance. Valence combines the technical expertise, responsive customer service, and solutions oriented resources of an entrepreneurial business, with the scale, capital resources and professionalism of a larger company. 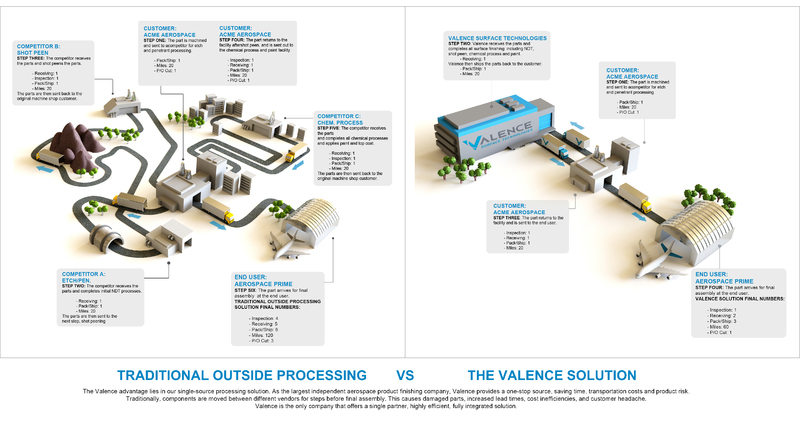 Valence… THE ANSWER to the long-standing Aerospace Industry challenges of an overly complex and highly inefficient supply chain, driven by supplier fragmentation, restricted capital access, lack of innovation and lackluster environmental stewardship. Over the last decade, the industry challenges have accelerated with the introduction of new technologies such as carbon fiber aircraft, followed by record backlogs, rate readiness constraints and today, a newly identified need – volume productivity and efficiency. As production rates continue to rise, companies must address rate readiness for the rapidly rising aircraft build rates and simultaneously focus on volume driven productivity gains to reduce costs. Unfortunately, most product finishing companies are not ready for this rapid shift and have struggled to make necessary technology and capacity investments to support their customers’ needs. • We simplify things for our customers by using a common, best-in-class quality management system to ensure performance, reduce risk and apply best practices across the enterprise. • We invest in capacity expansions, greenfield facility builds, new technologies and capabilities within our existing locations to ensure we stay at the forefront of the aerospace industry’s product finishing needs. We have never been more prepared to meet the aerospace industries rate-readiness and productivity requirements. Let us work in partnership with you to drive uncompromising quality, unmatched delivery and unparalleled business performance for your supply chain.